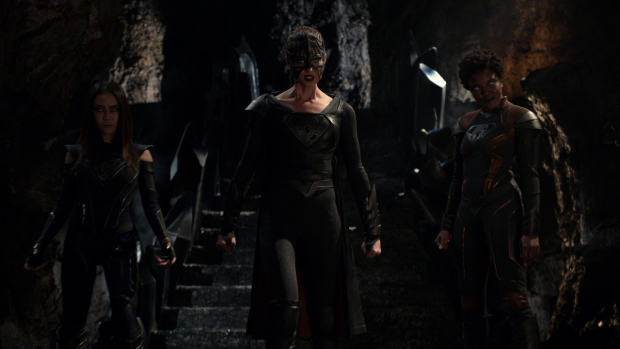 Supergirl deals with the fallout of Kara learning what Lena has been doing with Sam/Reign and the team faces off against the combined might of the Worldkillers. Lena Luthor has always been an interesting presence on this show. The Luthor label is always something she is going to have to battle against to some extent because of the off screen damage Lex did to that reputation. Throughout Lena has been characterised as a fundamentally good person trying to prove herself to a world that has pretty much written her off. Admittedly she doesn’t always help her case through some questionable actions. Keeping Sam locked up in a lab as she runs experiments on her doesn’t look great from an outside perspective. This fuels the conflict between Kara and Lena while altering their dynamic as a result. Lena’s secret attempt to find the thing that triggers Reign is a good way to explore her personal ethics without revisiting the prospect of her being a villain. The show never puts any doubt on Lena’s motivations in this instance; she was definitely motivated by a genuine desire to help a friend and she makes no apologies for her decision to do so. Her upbringing works against her to a degree because she was raised to be resourceful and value working alone which is against one of Kara’s core values; “stronger together”. She believes in this so completely that she has an inherent distrust of anyone who would rather deal with a problem alone even though it’s a very reasonable way to approach problems along with life in general. Secrets are at the root of this conflict. Lena kept this a secret and this causes Kara to feel betrayed as a result but she fails to consider her own approach to secrecy. As far as Lena is concerned this was Sam’s secret and it wasn’t Lena’s place to tell anyone unless she was given express permission to. In effect she was being a good friend to Sam by keeping this information to herself and fully stands by that decision because in her estimation it was the right thing to do. She points this out to Alex who lied to her about being a DEO agent. Lena understands why Alex did this and doesn’t hold it against her nor does she ever let on that she actually knows the truth because she respects the person keeping the secret enough to allow them to think they have kept it. Kara is hardly blameless when it comes to keeping secrets. Lena is one of her best friends and she lies to her face daily about who she is. This episode has her directly interacting with Lena as Supergirl without the truth coming out and she fails to see the hypocrisy within that situation. Once again Lena respects the decision to keep her identity secret but it doesn’t stop her directly calling Kara out on that decision. After one too many declarations of secrets being bad she challenges Kara to reveal her real name. Naturally Kara doesn’t do this which proves Lena’s point. Lena never stops defending her decision and never budges on whether she feels it’s the right thing to do. In her mind everything she did was justified and her mind won’t be changed on this subject. The best thing about this disagreement is that both sides have merit. Kara’s personal distrust of Lena favouring an isolationist approach is very much a character flaw but an understandable one because she has been raised to be trusting and rely on others to achieve her goals. As I’ve mentioned Kara keeps her own secrets and has decided not to trust Lena with her civilian identity. Despite this she expects Lena to trust her and treat her as she does when they interact as friends. Basically Kara wants to have this both ways and fails to realise how impossible this is because she has decided to keep Lena at a comfortable distance through keeping her in the dark about her true identity. She isn’t wrong in thinking that Lena’s isolationist approach has its downsides with the most notable one being that Lena is the only one working on the problem so if she hits a road block then the lack of extra minds to consider other angles vastly reduces her chances of solving it. It’s entirely possible that the DEO and/or Brainy would have been able to help learn more than Lena could do on her own. 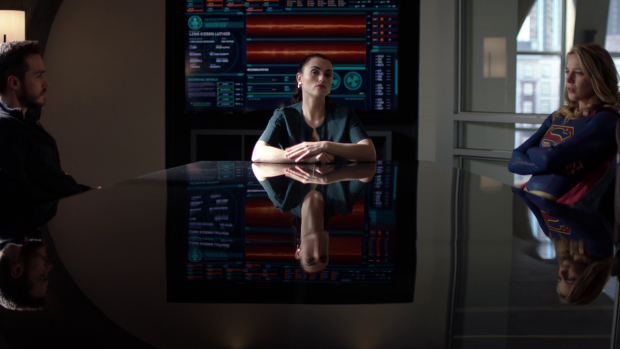 Kara doesn’t make the best decisions after learning Lena’s secret as evidenced by her knowingly putting James in a very difficult position by asking him to break into Lena’s lab as Guardian to find out if she has a stockpile of Kryptonite. Finding out Lena has been lying about one thing shakes Kara’s faith in her and leaves her wondering if there are more secrets being concealed. Kryptonite is a particular sore spot because Kara can be killed by it so feels the need to know if there’s any in the hands of people she know. Her fear can be understood and making a rash decision makes sense to a degree but it doesn’t alter the fact that James isn’t the person she should be asking. Kara’s reasoning for putting James in that position also makes sense because she needs somebody she can trust to do it but given her knowledge of James’ relationship with Lena she doesn’t fully appreciate what she’s asking. As I’ve mentioned before, character flaws make for more interesting characters and Kara putting James in this position definitely qualifies. This works out really well for James in terms of characterisation as it furthers his relationship with Lena in really interesting ways. His decision to lie about the contents of Lena’s vault is an important moment because it shows that he sees her as more than the Luthor name and genuinely trusts her. This is apparent when he admits to being Guardian later in the episode while admitting what he did. James displaying this honesty and trust has the opposite effect to Kara’s distrust and Lena admits to James that she figured out how to make Kryptonite. The implications of this are widespread as it puts James in a position where he has to choose whether to keep this a secret from Kara. He is basically in the middle of this disagreement between Kara and James and appears to have taken Lena’s side to a certain extent or has at least decided not to compromise himself by betraying her. I’m unsure how this will continue but it could end up being a strong arc for James. Her friendship with Sam continues to be the motivating factor for Lena and enables her to work with the DEO. She even uses that friendship to prove her usefulness when she points out that Supergirl doesn’t know Sam. Once an unexpected eclipse threatens to rob Kara of her powers Lena becomes instrumental in finding a solution. 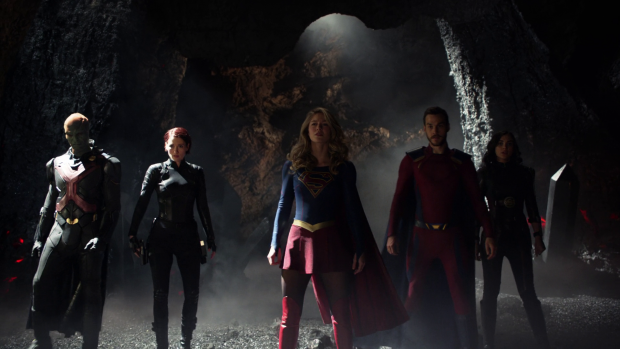 Lena’s knowledge of the vague alternate dimension that Sam goes to when Reign manifests helps team Supergirl formulate a plan involving using the same tech that Brainy used back in “Legion of Super-Heroes” to enter that dimension in an attempt to find out where the Worldkillers are hiding. The mission itself isn’t all that interesting but the tension between Kara and Lena means that it’s grounded in really compelling character drama. Ultimately it’s about friendship whether that be the strained Kara/Lena friendship or the strong Lena/Sam friendship. Those two angles are what give this weight and the stakes feel more urgent as a result. I found the eclipse itself to be less than threatening despite it weakening Kara and having far reaching consequences for all life on Earth. Ultimately it amounts to little more than a slowly ticking clock that isn’t treated with the level of dread that it should be. In general it comes across as “another day at the office” for Team Supergirl which definitely makes it less effective as a source of jeopardy. This is compounded by the complete lack of pay-off on Kara making Mon’El promise to pull Alex and Lena out of the alternate dimension while leaving her in there. It’s difficult for Mon’El because he has to knowingly let Kara suffer for the greater good. It’s a standard struggle but works well enough if the viewer is invested in those involved. The possible complication never actually happens because Kara ends up leaving relatively safely with both Alex and Lena. 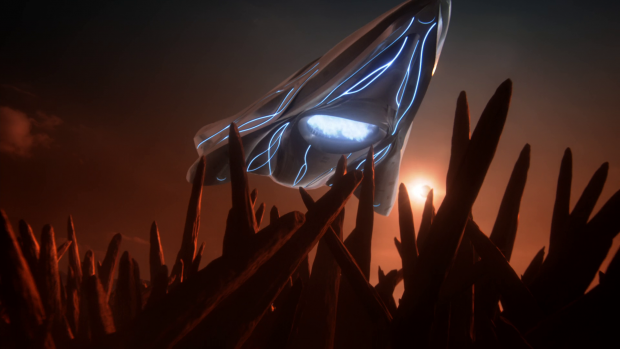 It is certainly refreshing that the show does something less predictable by having a last second rescue prompted by a difficult choice to be made by a character but the alternative isn’t any better. This moment mostly exists so that Mon’El can confess to J’Onn that he’s uncomfortable with this situation and doesn’t want to hurt Imra through his clear concern for Kara. J’Onn is as supportive as we have come to expect and offers Mon’El emotional support but it’s clear that he’s on his own in terms of resolving his own feelings. It appears that the dreaded love triangle is imminent based on the knowing looks that Imra gives Mon’El at various points of the episode. Now that they are considering returning to their own time this will clearly come to a head sooner rather than later. The villain story is handled really well even though the eclipse is basically an excuse to move plot along rather than being anything significant on its own. Sam and Julia’s internal battle takes the focus here thanks to their experiences in the alternate dimension. This clearly establishes that Grace has fully submitted to Pestilence as she is represented by a dead body showing that the Human side of her is gone. Sam and Julia aren’t beyond redemption yet but they are swiftly losing their sense of self and struggling to hold onto it. Sam has the idea of writing everything they can remember to hold onto some semblance of Humanity. 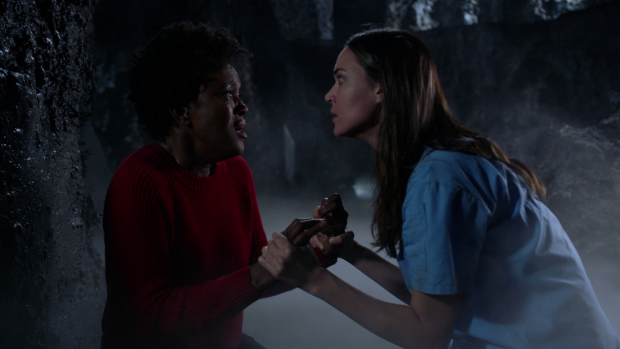 Odette Annable and Krys Marshallare excellent in these scenes with lots of frantic energy to their performances as their characters continue to struggle against powerful personas. Using Sam’s idea for Reign to realise what connects Sam to her Humanity so that she knows what to target in order to take over completely is a really nice touch as it’s something that both helps and hinders Sam though I’m sure Reign had other ways to find out about Ruby if she really wanted to. I really enjoyed the fight in Reign’s fortress as it was exciting, tense and really well put together from an action point of view. Kara’s weakened state was a nice contrast to her determined spirit and ending it with Julia holding Purity back long enough to defeat Pestilence in order to save Team Supergirl was an appropriately emotionally charged ending. The fact that Julia dies along with her darker side and takes Pestilence with her adds more weight to it as it shows that Julia would rather die as herself rather than live as a Worldkiller. It’s very powerful stuff and an appropriate end point to this struggle plus it brings hope that Sam can overpower the Reign persona at a later point. What doesn’t work about this is that it feels anticlimactic in the context of the wider story. A big deal has been made out of the Worldkillers so bringing down two of them at once is a waste of potential. This is especially true when considering how readily Pestilence was teased before her introduction last week only to be dispatched a week later while making very little impact. There was at least another two or three episodes worth of strong villain storytelling with three Worldkillers working together especially when two of them are battling their inner Humanity. 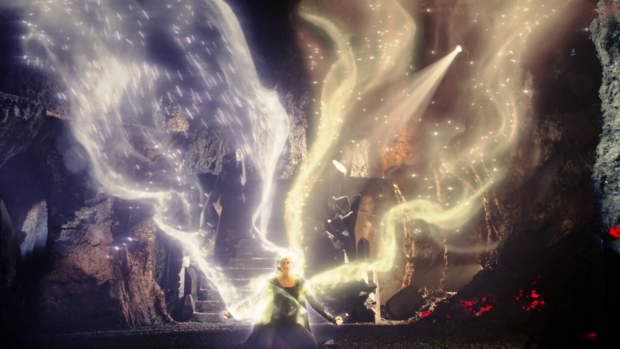 It will be interesting to see how Reign evolves after absorbing the essence of the other two. This suggests that Mon’El and Imra have made the situation worse by interfering or that they may be the cause of the Blight that they are working so hard to stop. It has been mentioned that historical records are fragmented so anything is possible at this stage. A solid episode that does some things really well but is brought down by some questionable decisions. The conflict between Kara and Lena is really well handled with strong arguments delivered by both sides as well as some compelling character flaws brought to the surface. Both positions can be understood and framing Lena in a questionable moral position motivated by friendship and a desire to help is much better than going back to the well of hinting at her being a villain again. Her motivations make sense and her morality continues to be complex though she is preserved as a fundamentally good person. Kara putting James in the difficult position of breaking into Lena’s lab does wonders for him aas a character and develops his relationship with Lena as it gets to the point where they confess secrets to one another that puts James in a different difficult position but shows how valuable trust is in any relationship when contrasted to how Lena regards Kara’s approach to the situation. There is a lack of urgency to the situation that need dealt with in this episode. In general it feels fairly routine for the characters involved and any opportunity to create jeopardy is wasted. Kara’s conversation with Mon’El where she makes him promise to leave her in danger should have paid off but doesn’t and the characters are all brought out with plenty of time to spare. It merely exists to develop the upcoming love triangle. The main action sequence is really impressive with the different elements coming together nicely. Julia overpowering purity and defeating Pestilence at the cost of her own life is really powerful though removing two Worldkillers after building them up for so long feels like a waste. Sam and Julia’s attempts to hold onto their humanity makes for an engaging character piece and raises the stakes when Reign learns about Ruby.